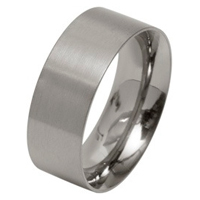 Unusual men's titanium ring with high polished curved edges, and a textured centre, most comparable to a bark textured finish. The titanium ring has a width of 7mm, and a depth of 2.3mm. The bark effect centre is polished, whilst the recess of the pattern has a textured finish in order to give a 3d effect to the pattern, the sides have a high polished finish.The bark pattern measures 4mm whilst the polished sides each measure 1.5mm. The inside of the ring has a court (rounded) interior for a true comfort fit and has the wording "Titanium" on the inside. This titanium bark pattern ring is available in UK sizes N to Z+6 from stock. 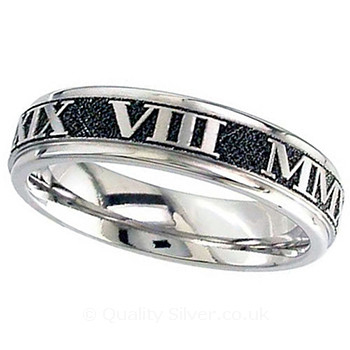 We are able to engrave this titanium ring however we are unable to offer our stone setting service on this ring. A masculine style titanium ring for the modern man. Ring Profile : Rounded inside, and outside.